... that title was a mouthful. Remember my 'hypnotizing black squares' over neon green corner gradient from last month? Remember how I spent hours slaving over striping tape placement in order to achieve the uniform directional look? No? I do. Hours of my life I will never get back. BUT NOW I have a solution! 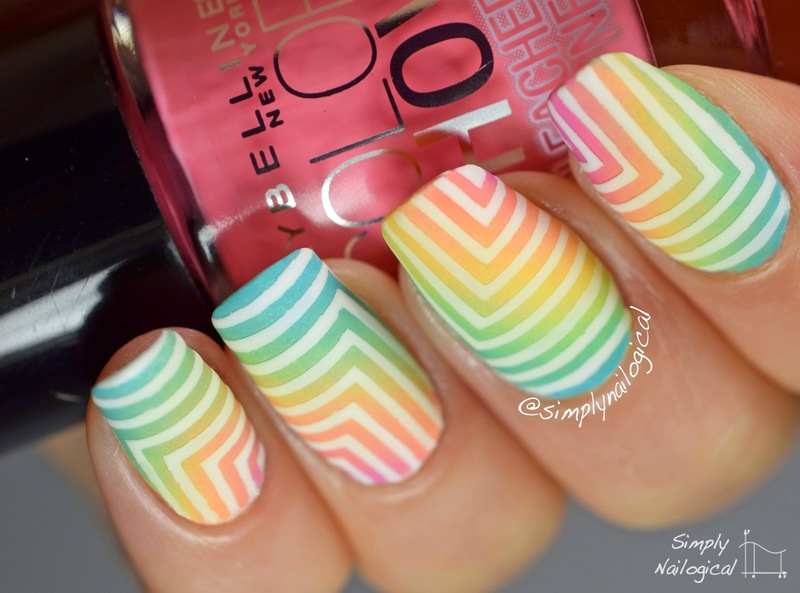 Introducing right angle nail vinyls that come in varying thicknesses from as thin as striping tape to about triple that thickness. 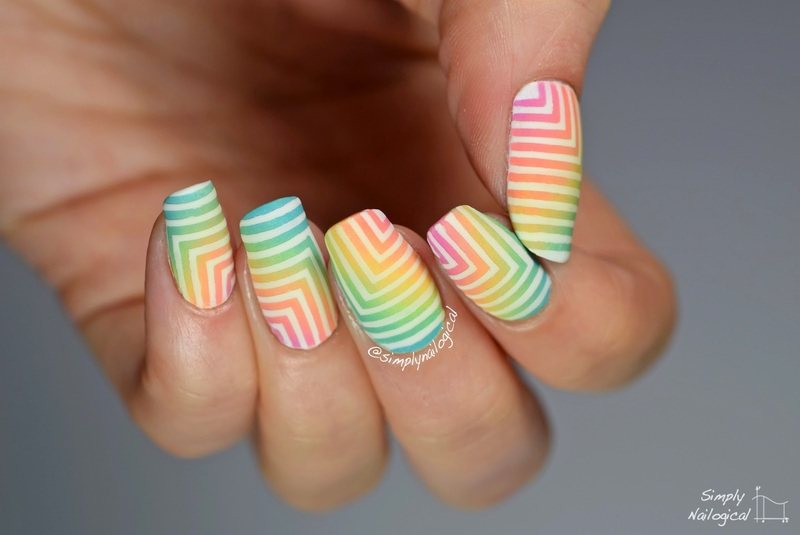 You can buy them straight from the Nail Vinyls shop online. If only the many talented (and patient) ladies who recreated my ridiculously time consuming mani knew this before they, along with I, committed nail art suicide. 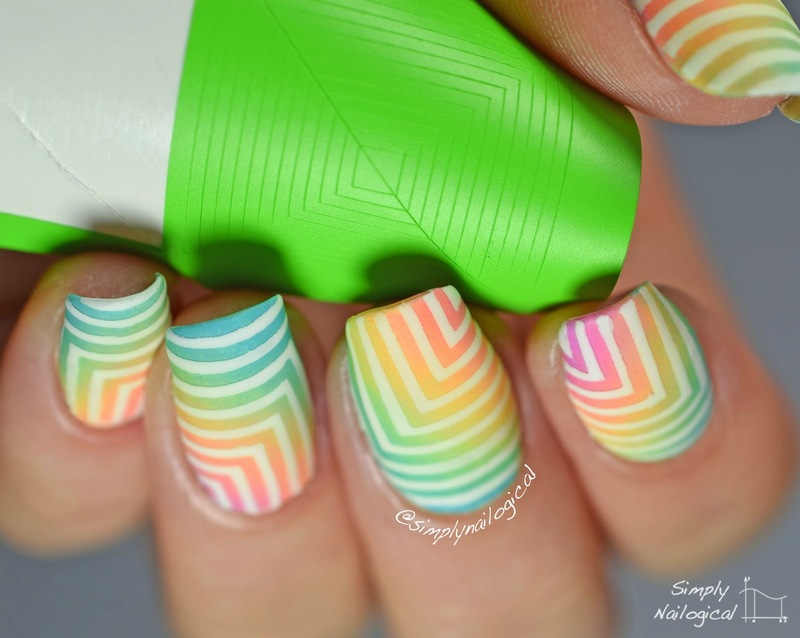 Some might argue that stamping plates with a directional right angle pattern like this might be easier than working with nail vinyls. I'd tell them: well sure, but you're limited to one colour and that design template. With these vinyls we can create entirely different shapes and stencils out of them as opposed to being limited to this one way of using them. For today's look I kept it straight forward and replicated the same dizzying directional angles over a corner gradient look (ha, I'm calling this straight forward), but my brain is already hurting thinking of what other nonsensical patterns can be made with these vinyls. 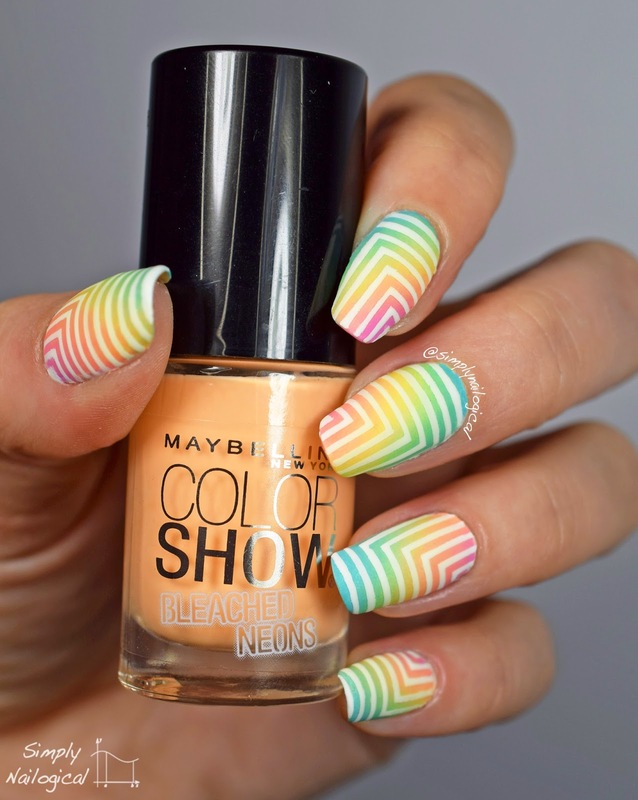 Back to matte because I decided in the end that these Maybelline bleached neons looked best matte when paired with white. The matte intensifies the 'bleached' tone of these polishes and was a little (just a little) easier for my camera to photograph. This post is pic heavy cause I was in a trance deciding which ones to post of the 4726739757 I took. My makeup sponge after the corner gradient massacre. Whatever is going on the with the colour/contrast balance I will never know... neons make the camera go crazy. Must have been the sponge in this shot. 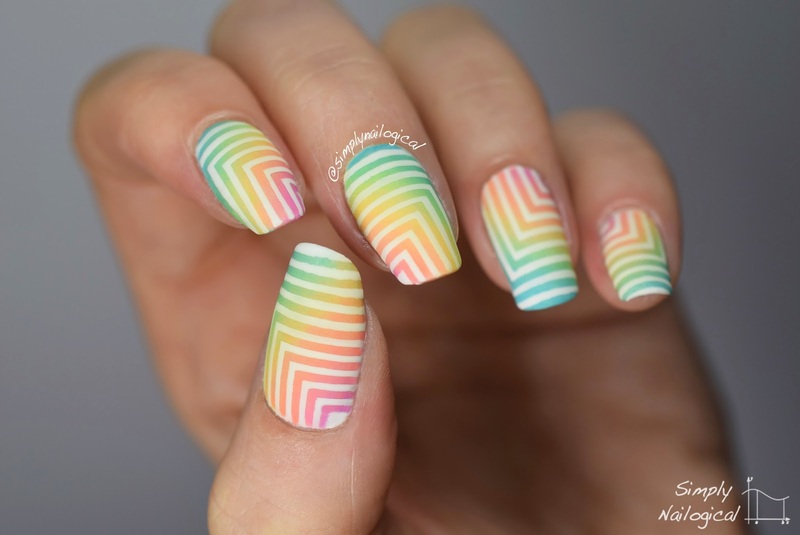 Right angle nail vinyls gets the job done! This is the thinnest of four different thickness of these right angle vinyls that come in a square cut into two. Do you know difficult it is to hold SEVEN NAIL POLISH BOTTLES in one hand? Basically impossible. This was shot as my wrist began to cramp and just before I dropped all but maybe two of the bottles on my desk. 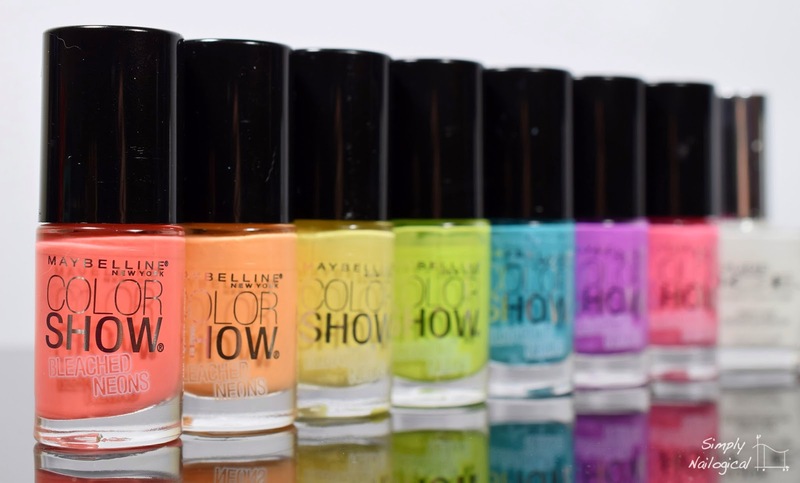 Curse you, Maybelline bleached neons, for having a seven-piece collection instead of four. Macro! The blue part of the gradient right by my cuticle got a little wonky and uneven on my middle finger; I had to touch it up with a a paintbrush later. I blame the Yellow Stopper Base Coat from Sally's, which I actually use when I'm doing a mani I'm not going to be wearing for long because it is notoriously known to cause polish to actually peel off the nail. That's what's happening at the bottom there, boo. Ooh, neony colour show! That's right, coloUr show!! Damn American spelling. I'm Canadian, eh? 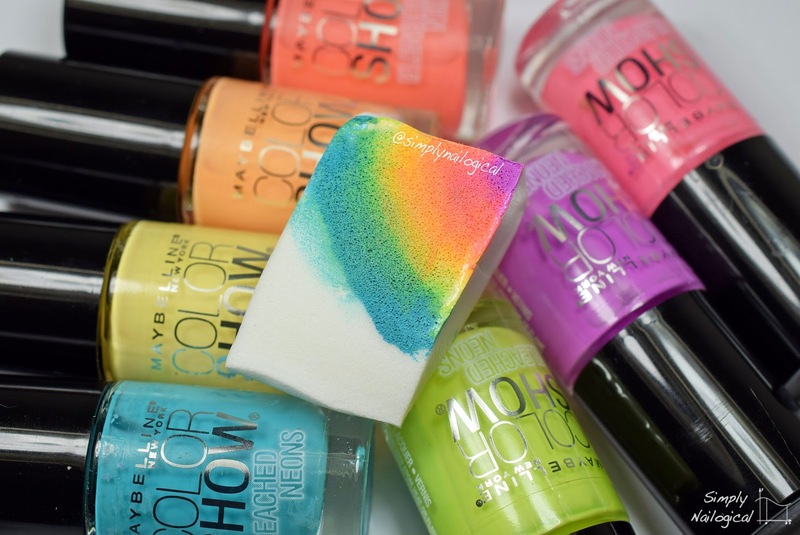 Apply all 7 coloured polishes on sponge in a radial pattern starting with purple in one corner of the sponge and the others 'radiating' outwards. Sponge onto nail ensuring that the purple corner is hitting a corner of the nail. Repeat step 2 and 3 to achieve desired degree of opacity and coverage, I did three coats. 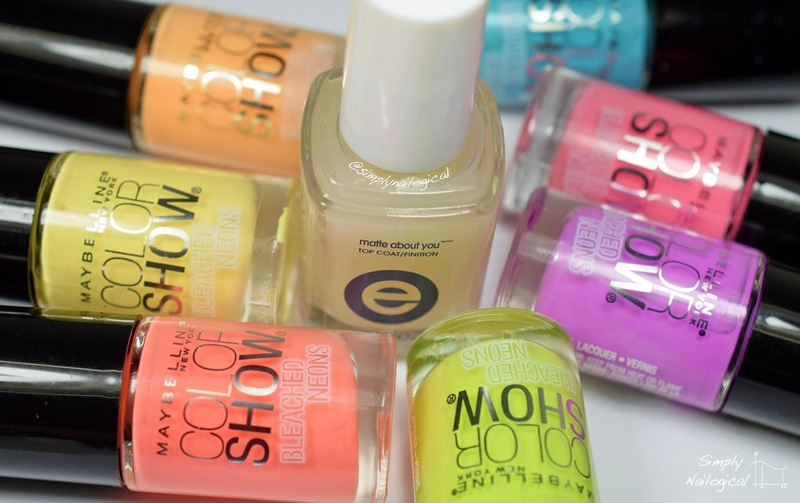 Apply quick dry top coat - I always use Glisten & Glow's HK Girl top coat and let fully dry. 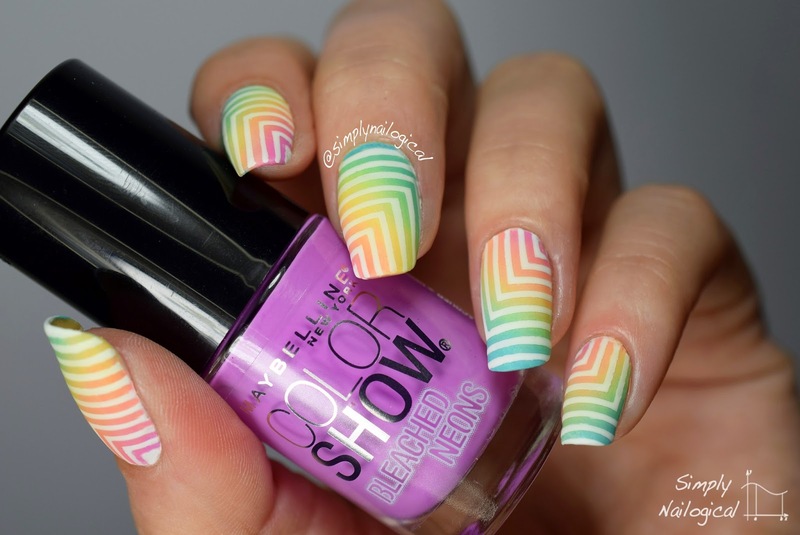 Take a half cut piece of the full square of right angle vinyls as show in the video and stick onto the nail with the smallest triangle piece in the corner where your purple gradient began. Remove every other nail vinyl with tweezers - this is the area that will be painted white. 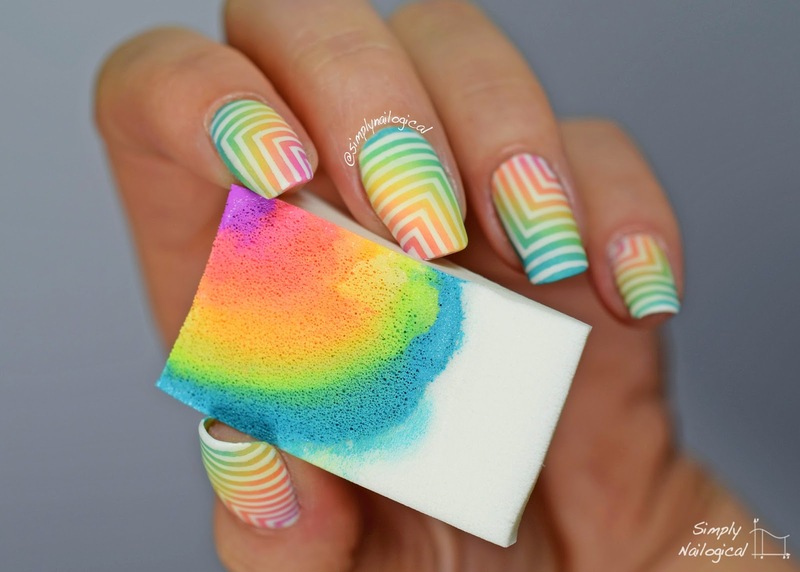 As you work your way down the nail, there may not be enough vinyl to cover your full nail depending on how long they are. If you have a few spaces missing, simply use the pieces you've just pulled off and append them to the end missing vinyls, filling in all lines and then removing every other one to ensure even spacing throughout. 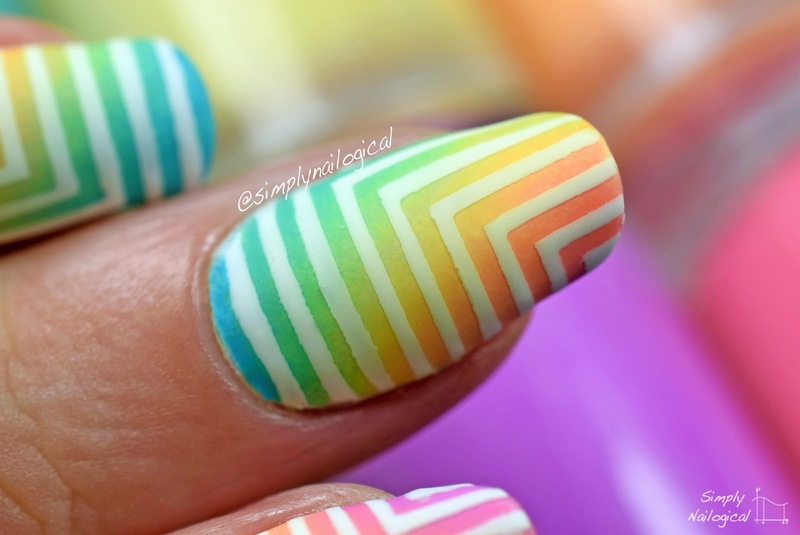 I demonstrated this vinyl placing technique in a more straight forward chevron mani video in this post. 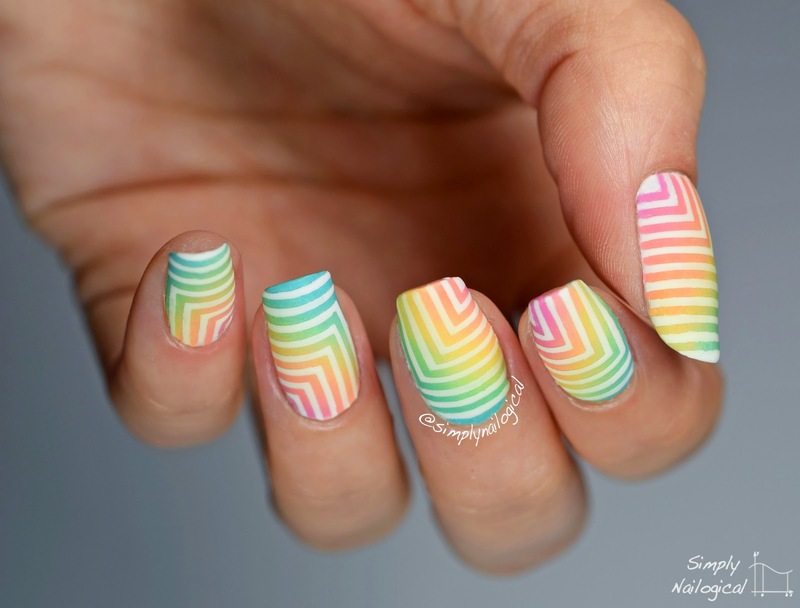 Make sure all the ends and sides of the vinyls and firmly tucked into the corners of the nail, by the cuticle, etc. 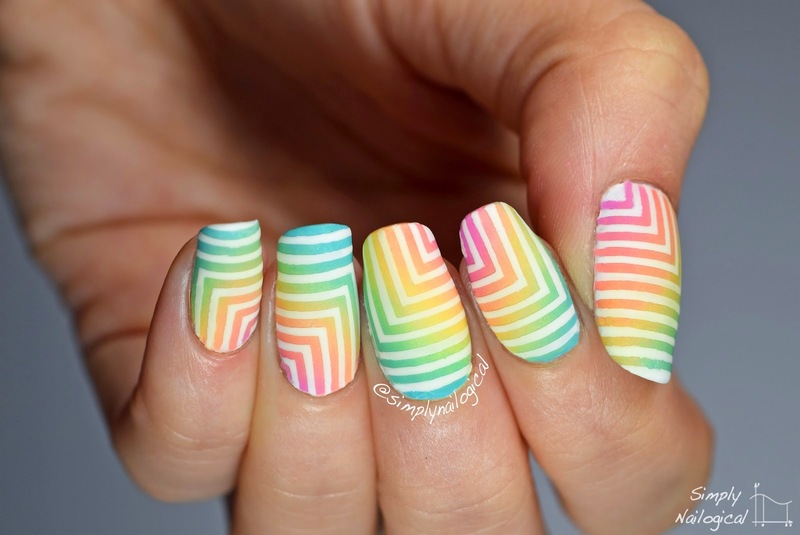 Take your white polish and begin painting one end of the nail. Fill in a couple lines and then immediately take off only the vinyls that have white filled in on both sides. Next work your way down the nail; white polish in a few gaps, take off those vinyls, etc. This is to ensure the white polish doesn't have time to dry (polish will turn goopy and may rip the white gaps up if you wait too long before removing the vinyls). After all the white has been filled and all the vinyls removed, let sit for a minute or two before applying top coat to avoid streaking. Et voila! 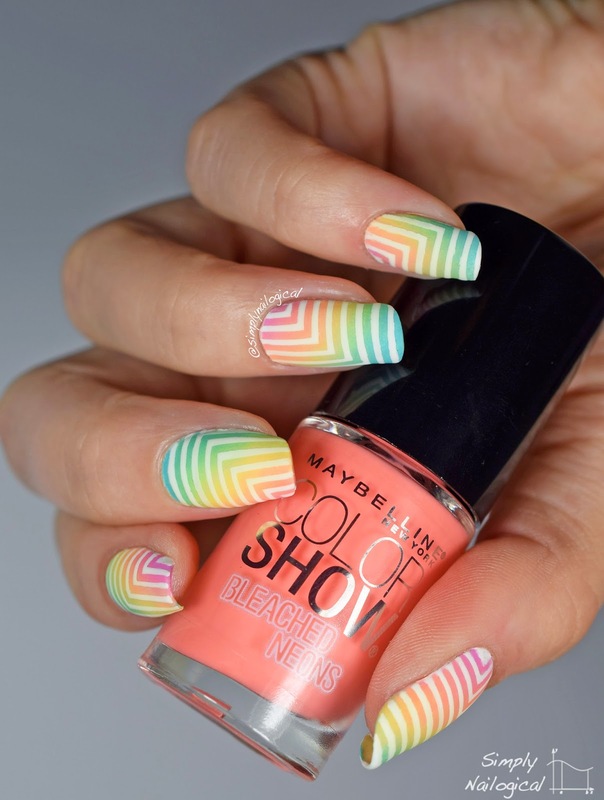 A hypnotizing summer mani that's bound to get you free ice cream from somewhere when you tell them you did this yourself. *Note: Right angle nail vinyls were provided from Nailvinyls.com for my honest review. Woah! Stunning as always, Cristine! But this time you outdid yourself! I also love the bleached neons. It's a pity we got only four shades here in Germany. Thanks Jenny! 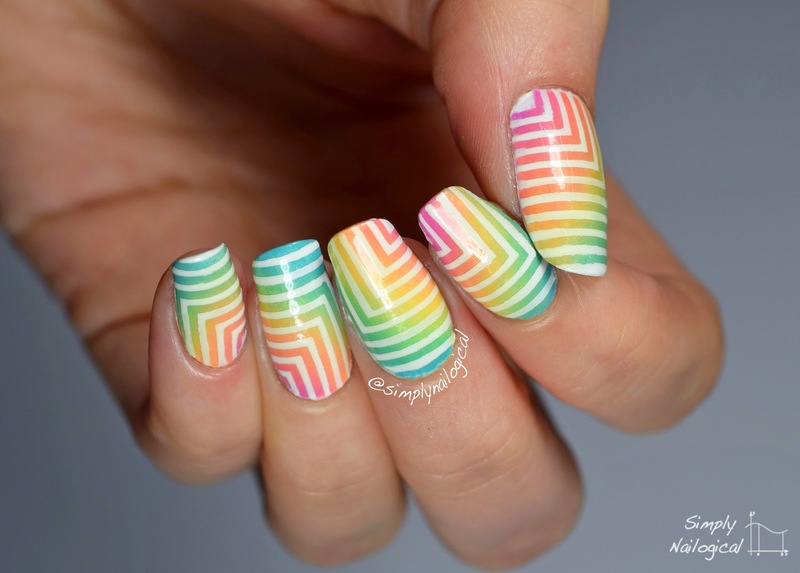 The bleached neons are pretty opaque so they are perfect for making gradients! I'm so sorry to hear you guys only got four, what up with that?? So silly! This is so effing amazing! I am in awe. 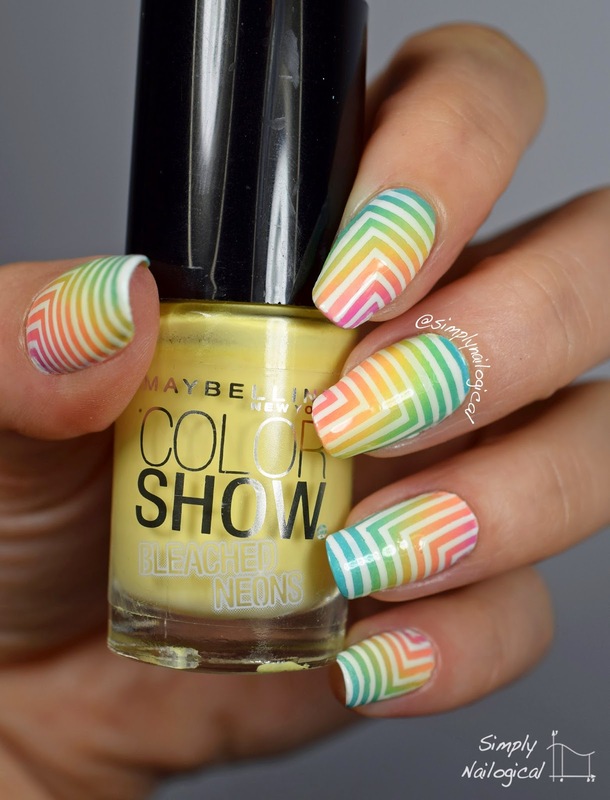 ya know, I found this on the nail polish canada challenge. I voted for mine....but this is damn impressive! Now i want to try it. Without nail vinyls (expensive). Gah. So many colors!